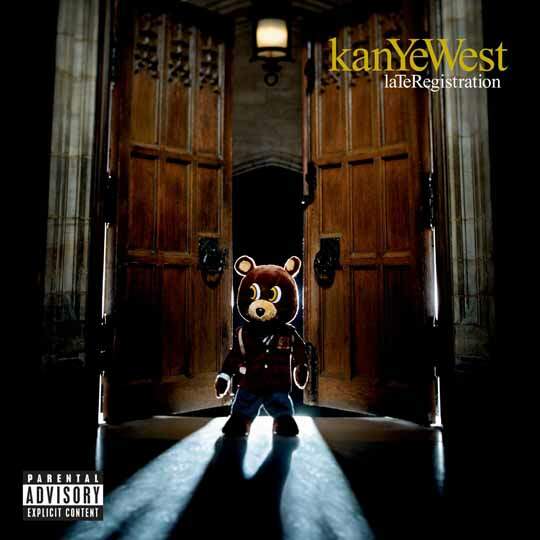 Singles: "Diamonds from Sierra Leone," "Gold Digger," "Heard 'Em Say," "Touch the Sky," "Drive Slow"
Art Direction: Morning Breath, Inc.
Late Registration was an artistic and lyrical continuation of the idea that Kanye wouldn't fit into the rap game's current status quo. Designed by Morning Breath Inc., the cover's Dropout Bear shrinks down to the size of a child, standing in between gigantic wooden doors, emphasizing that the rejuvenation of the genre would be a huge responsibility. It was photographed in an actual university, further continuing the theme of education and critiquing the structure and limitations of school. Throughout the booklet, which has a banner reading Tardus Subcriptio (Late Registration), Dropout Bear enters the school, sits in empty classrooms, reads books, and then leaves (resembling the front cover).The style was directly inspired by the works of American satirical painter, John Currin, who is said to be one of Kanye's favorite artists.